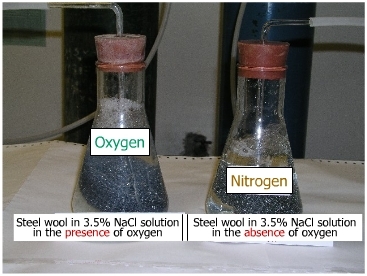 Objective To demonstrate the importance of oxygen in the corrosion of Iron in 3.5% NaCl solution. Pour 250 ml of 3.5% NaCl solution in to each of the 500 ml conical flasks. Use gleass tube as bubblers. Connect one to the source of nitrogen and allow it to bubble through 3.5% NaCl solution in one of the flasks. 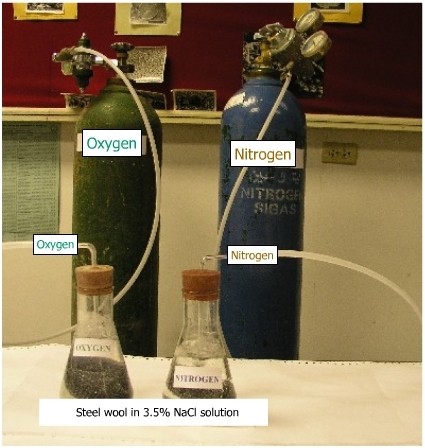 Similarly allow oxygen to bubble through 3.5% NaCl solution in the second flask. Introduce the steel wool in to both the flasks containing 3.5% NaCl solution. Continue bubbling the gasses through their respective flasks and observe the developments of rust during a period of several hours. Iron does not corrode in water saturated with nitrogen. 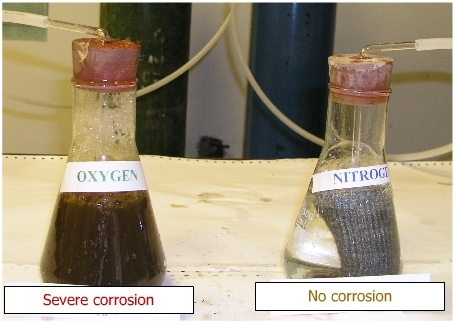 Oxygen is a corrodant as shown by the change of color of water to brown because of corrosion of iron. Passing nitrogen in the system to blanket oxygen is called “Deaeration”.